Offers the men in our Parish spiritual enrichment and fellowship. The goal of the various STM Men’s Fellowship opportunities is to bring together like-minded men with a growing hunger for God. This will give the men of our Parish and the surrounding community an opportunity for fellowship and discussion, and to grow through spiritual bonding with other men; taking into consideration the spiritual needs and experiences that are particular to men. These gatherings of men will promote, support, strengthen, and help maximize the spiritual growth of the men of St. Thomas More Parish by taking responsibility for our faith formation and by offering support through fellowship, prayer, scripture reading, communication, and networking. As Catholic men united, we can grow to be better sons, husbands, fathers, and brothers in Christ. The annual Men’s Retreat for the “Everyday Guy” will be held October 12-14 at Green Oaks Ranch in Vista. This year we are featuring four regular guys from the Parish giving talks on “Resilience. For more information, contact Deacon John Fredette at email or at 760-758-4100 x104. iHunger Meets every Saturday from 6:45-8:15am in the lower level of St. Thomas More (we are off over the summer). Feel free to drop in and check it out! St. Thomas More Catholic Church, 1450 South Melrose Drive, Oceanside - Parish Center Lower Level). Breakfast is off site on the first weekend of each month all year round. To register or for more information, contact Deacon John Fredette at email or at 760-758-4100 x104. 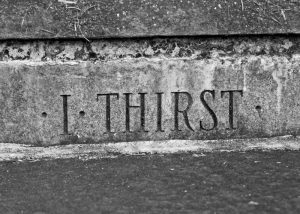 iThirst meets randomly a few times each month at various locations, the men are notified of what going on by opting into the text messaging group. To find out what’s going on or to get more information, contact Deacon John Fredette at email or at 760-758-4100 x104. Includes weekly (Saturdays at 6:45am), monthly, and annual activities.